Last week, in my card class, we made 3 amazing cards. This is one of them. I saw a card over on Mary Fish’s blog with the same window/ghosts. I managed to change the card up enough to make it my own … I hope! 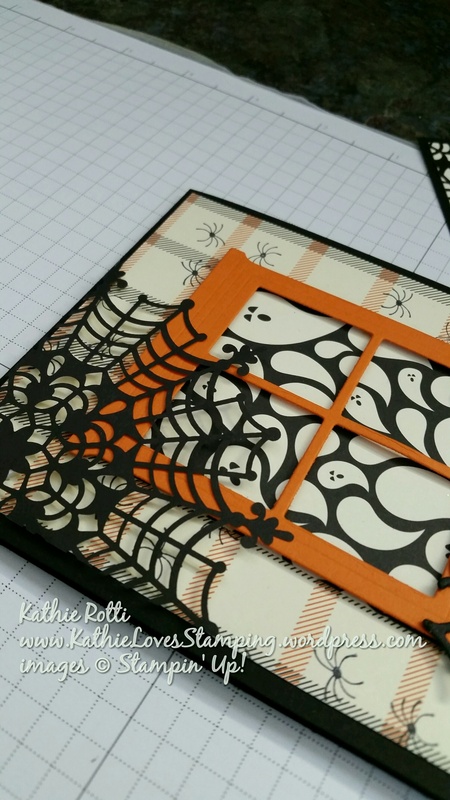 I used the Happy Haunting Designer Series paper from Stampin’ Up!’s holiday catalog, “Handmade for the Holidays” (September 1, 2015- January 4, 2016), for the wallpaper and the window full of ghosts. As a matter of fact, everything I used (except cardstock and ink) is from the holiday catalog. I cut the wallpaper 4″x 5.25″ and the ghost piece is 2.5″x 3″. Since I planned to used the Spider Web Doily in the corner, I stamped little spiders all over the wallpaper with a stamp from “A Little Something“. 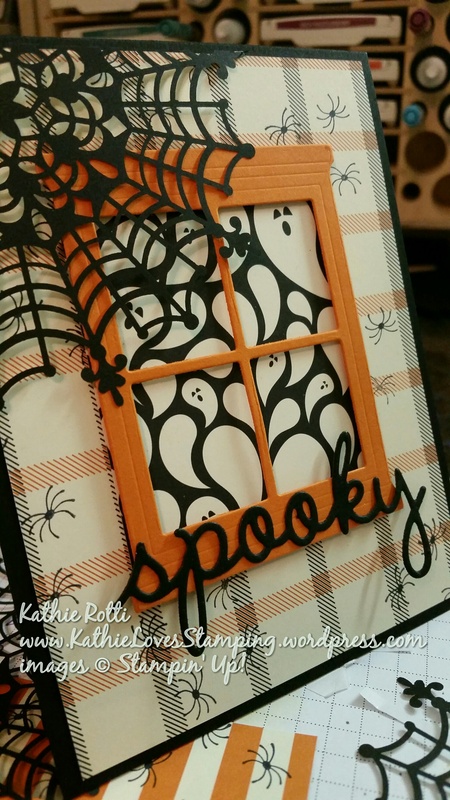 “Spooky” is cut from the “Seasonal Frame Thinlets Dies“. The Window is from the “Hearth and Home Thinlets Dies“. Dimensionals pop up the center of the spider web and the window frame. 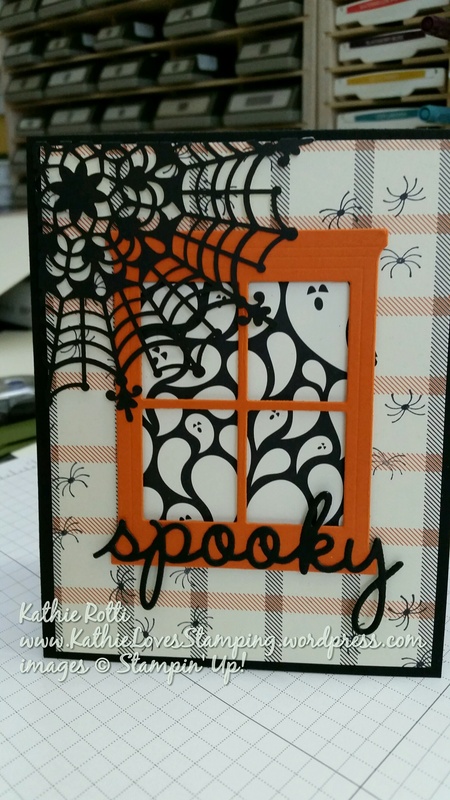 Our new Fine Tip Glue pen works perfectly on the “Spooky” and inside doily scraps!!!! I can’t do a card and leave the inside blank!!! I made use of my doily scraps in the corners. I used the appropriate sentiment from “A Little Something“, stamped in Archival Basic Black Ink and colored it in with my Pumpkin Pie Stampin’ Write Marker. 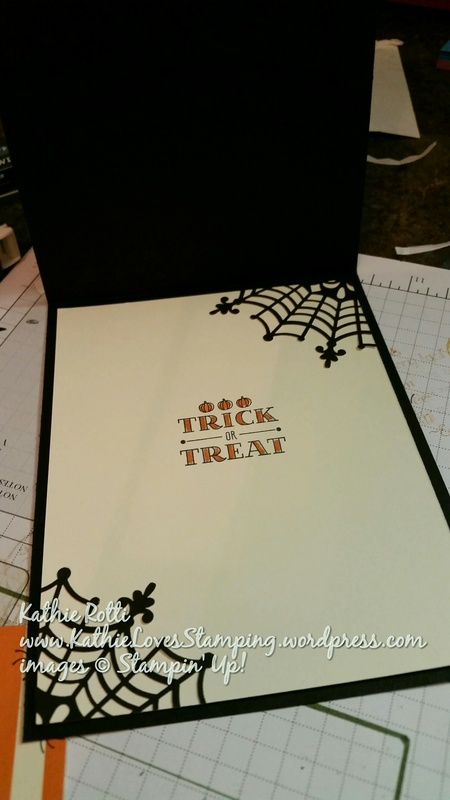 I hope you love this card as much as I do … I don’t usually make much for Halloween … but I just couldn’t resist this one! Check out below for everything I used in the creation of this card.